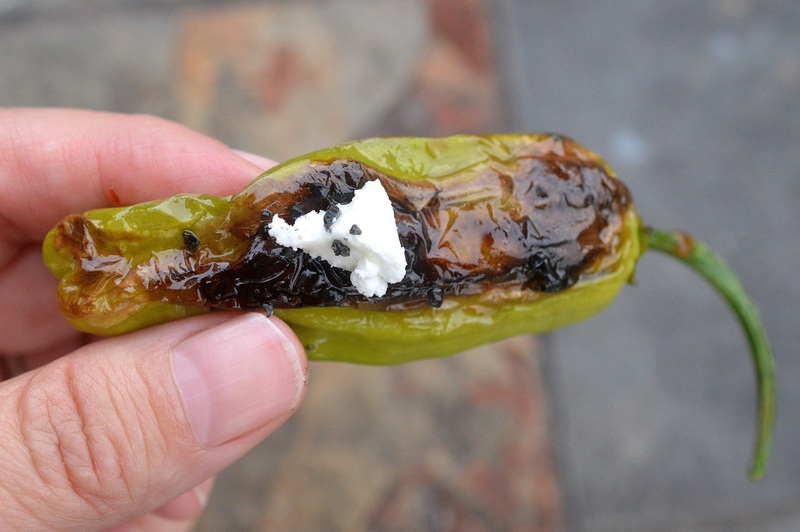 If you enjoy jalapeno poppers, then I am sure you’ll also enjoy Shishito Peppers with Goat Cheese & Chili Sauce. They are a nice change from jalapenos. They make a great light dinner or party appetizer. I eat them for lunch sometimes. I first had shishito peppers at a local restaurant (that leans a bit towards farm-to-table) and my husband, friends & I immediately fell in love with them! They don’t serve them with goat cheese, however, every time I am there, I ask them to sprinkle goat cheese over-top, the cheese with the peppers and sauce make sense to me and now I don’t want it any other way. If they don’t have goat cheese in the kitchen…I pass on them and pick another app. I find shishito peppers at my Saturday morning outdoor farmers market in Wrightstown, Bucks County PA. Farms in NJ and PA have been growing them since they became trendy and if you get to this 4-hour a week market early, you get all the best fresh local produce. I am very lucky to live in such a fertile, farm-filled area. Outside of that, you can find them at Trader Joes and I am sure Wegmans has them as well. 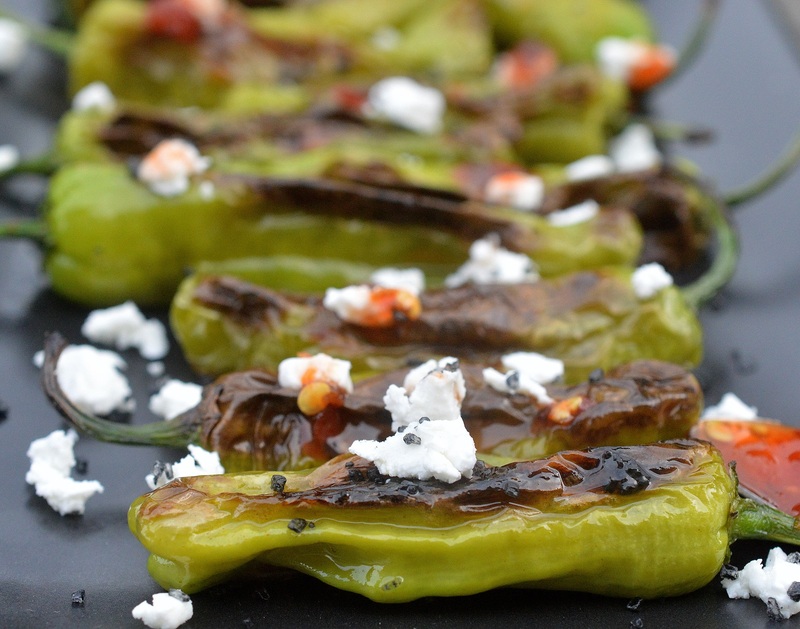 Shishito Peppers with Goat Cheese & Chili Sauce are a snap to make! All you need to do is blister the peppers in a pan or on the grill. After that sprinkle them liberally with black lava salt and goat cheese. The dipping sauce is just 2 ingredients and ties it all together. For a more robust dish, serve these with crostini rounds and simply scoop some up, drizzle with the sauce and inhale! I don’t like cooked green or red peppers at all! I don’t want them on a sandwich, in soup, omelets, with meat, in rice…Blech! One little piece of a cooked traditional pepper contaminates a dish for me. Meanwhile, my husband loves them. I always make my portion of whatever…without. Poblano and jalapeno are ok, especially if they are stuffed with something. When it comes to shishito peppers, however…I can eat them all day long! They are mild. Once in a while, you may bite into a hot one but for the most part, they are tame. The above is the typical size. Some are smaller. 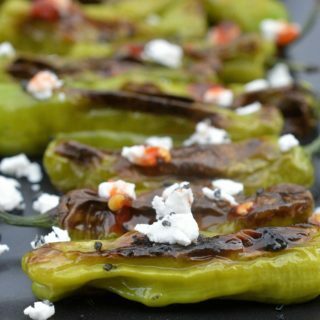 Keep on the look out for these cute Japenese Shishito Peppers and make Blistered Shishito Peppers with Goat Cheese & Chili Sauce! Let me know what you think! Toss peppers with oil in a large saute pan. Heat to med-high heat. Toss peppers every minute or so, be careful, once they get hot, they pop and sizzle. Remove from heat to toss necessary. You can lower heat to medium heat halfway through as well. 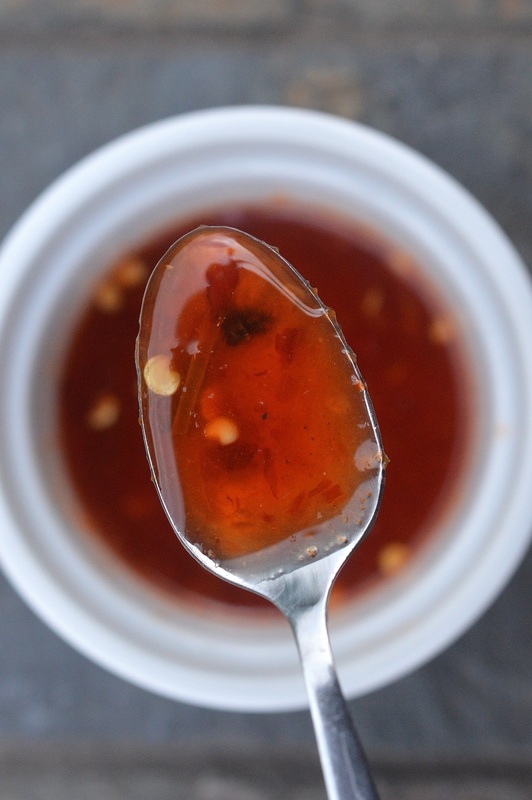 While peppers blister, mix honey and chili with garlic sauce in a small ramekin until fully combined. 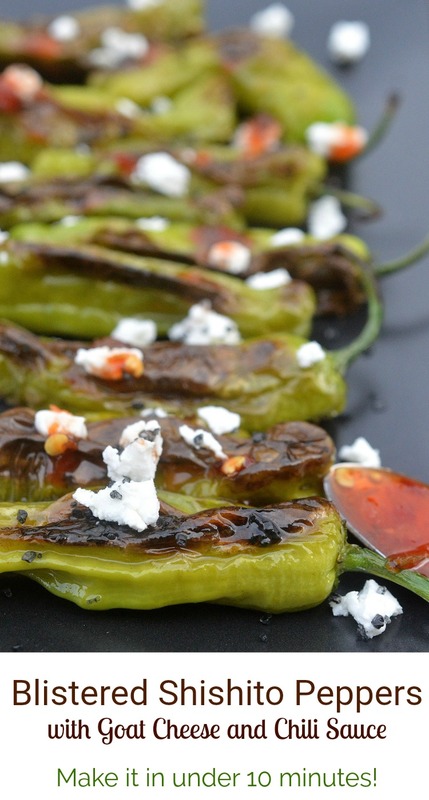 Turn peppers out onto a serving dish, sprinkle liberally with black lava salt and goat cheese and enjoy. If serving with crostini, you can dot the serving dish with them and turn the peppers out on top of the crostini. You can also blister these on your grill in a grill pan or tray or on aluminum foil. The smokey flavor from the grill is a bonus!